Our parenting center provides activities, classes and educational opportunities for the whole family. Celebrate Jewish holidays, cultivate essential developmental skills, create play-filled memories, and much more in a warm, welcoming community. 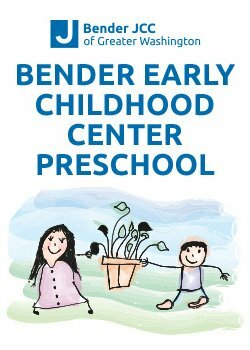 Questions about the Bender-Dosik Parenting Center? Contact us! The center is made possible by grants from the Bender Foundation and The Jewish Federation of Greater Washington. Connect with new families and bond with your little one in a nurturing and hands-on environment. The Parenting Center supports your young and growing family with fun and diverse programs. Spark interest, stimulate creativity and enhance development through a variety of classes designed for infants, toddlers, and parents. Moms will learn mom-baby postures and massage techniques designed to promote bonding with each other and bring a sense of calm to baby. Strengthen, stretch and relieve stress while getting to know other moms and babies. Feel free to stop your practice to change a diaper, get some water, nurse, etc. No yoga experience is necessary. Did you know all children are musical? Build on your child’s natural enthusiasm for music and movement and learn the skills to support the natural process of music development. This class is designed for walkers through age 4 and mom, dad or caregiver. It will use fun games, songs and stories to engage the toddlers. Mom/dad/caregiver will play along with the kids and get some yoga instruction themselves while toddlers explore and watch. No experience necessary. Story Time is a joyful exploration of literature for children through song and movement, supporting early literacy and language in a developmentally-appropriate setting. Following Story Time, enjoy imaginative play, space to climb and explore, and age-appropriate toys. Target Age Group: Two months – three years with parent/caregiver. Spend a fun-filled morning celebrating Shabbat and other Jewish holidays and themes. Learn about customs, traditions and prayers through art, music, movement and storytelling. First-time moms with babies 2 weeks-5 months. Parent And Community Education (P.A.C.E) is a special group that meets for eight two-hour sessions to discuss a variety of topics including eating, sleeping, crying, attachment, disposition and play. Time is also set aside for members to share experiences, ask questions and express concerns. Do you wonder how to raise your children to be responsible, respectful and trustworthy-all while getting dinner on the table? Do you worry about cyberspace, peer pressure and other facts of modern life? Parenting, while it brings much joy, is hard work. This class provides a sound framework for positive parenting and proven skills to understand and solve behavior problems. Learn how you can be closer and have more fun as a family while also motivating your children to be more cooperative, self-disciplined and successful. Presented by acclaimed psychologist Dr. Kay Abrams, this two-part series will address the day-to-day struggles that parents of young children encounter. Dr. Abrams will focus on how to parent with a calm, confident authority.